Top: Delta Cep is the star denoted in the bicep of the King's mighty arm which holds the ruling staff. Bottom: Delta Cep and its convenient comparison stars. For proper orientation, refer to the AAVSO Cepheus finder chart. Cepheid variable stars, named for their archetype delta Cephei, have provided astronomers with a wealth of information about our Universe, a feat that no other class can claim. Studies of this type of variable star have provided a key component in unlocking one of the most precious secrets of the Universe: a way to determine cosmic distances. This revolutionary finding has forever changed the way astronomers think of our Universe. With so many impressive credits to its name, it is no wonder that delta Cep sits in the King constellation of Cepheus, for it is truly royalty among the stars. 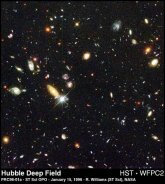 Image Credit: Robert Williams, the Hubble Deep Field Team (STScI), and NASA. Delta Cep is a terrific "starter" variable star for the amateur astronomer looking a place to begin, or for the student seeking a research project for math and science courses. The interest in studying delta Cep is further enhanced by the excitement involved in observing an object that is so closely linked to opening the secrets of our Universe. For the amateur astronomer, the bright star proves to be an easy and satisfying object to observe. Armed with a finder chart, the observer does not need more equipment than a pencil, a piece of paper, and a watch to make observations. The recorded estimates should then be compiled and sent to the AAVSO for inclusion in the AAVSO International Database. They must be bright enough to observe throughout their entire variability range. There must be suitable comparison stars. To keep student morale up there must be detectable variability during the course term (over two months ~60 days, say). They must be visible in the evening sky during the term. He also states that "Cepheid variables are good because they are always changing and have very convenient periods." Delta Cephei fits this bill perfectly and is a highly recommended variable in pursuing such a study. As a start, you may want to check out our tutorial Observing Delta Cephei. By the late 1700s, variable star discovery had virtually come to a standstill, with only 6 known stars in existence. Convinced that there must be more, English astronomer Edward Piggot began a campaign to expand the count of variable stars. With him in his search was Piggot's 17-year-old deaf-mute neighbor, John Goodricke. Goodricke, who had acquired his physical handicap during infancy, lived under fortunate conditions. While it was common in those days to refrain from educating a person with such a handicap, Goodricke's parents saw that he received a proper education. Goodricke proved to be a bright student, and excelled in both mathematics and astronomy. His interest in astronomy was further fostered by good friend, neighbor, mentor, and variable star companion, Edward Piggot. Defying the odds of prejudice belief, Goodricke was honored by the Royal Society of London in 1783 when he was presented the prestigious Godfrey Copley science medal for his work in determining the period and cause of variation in the great variable star of Algol. The remainder of Goodricke's short life proved fruitful as he and his comrade Piggot worked to discover more variable stars. Eta Aquila was the first to be discovered by Piggot in 1784, followed by Goodricke's discovery of beta Lyrae and delta Cephei, both also in 1784. This worthy young man exists no more; he is not only regretted to many friends, but will prove a loss to astronomy, as the discoveries he so rapidly made evince. Piggot, however, went on to discover two more well-noted variable stars: R Coronae Borealis and R Scuti, both in 1795. In just over a century after the discovery of delta Cephei, 33 variables of Cepheid type were known to exist; all of which had a range in brightness of a full magnitude and periods of just a few days to 39 days. In 1895, E.C. Pickering announced that after investigating plates taken at the Boyden Station in the high Andes in Peru, S.I. Bailey found a number of variables with Cepheid characteristic within some globular clusters. These variables, however, had periods that were much shorter than the known Cepheids and were on the order of a fraction of a day. Upon further study it was found that these clusters were virtually mines of Cepheid variables. Because of their location, these stars were termed cluster Cepheids. Hence, the number of known Cepheids dramatically increased within just a few short years after initial discovery of the cluster-type Cepheids. These smaller amplitude variables, have come to be known as RR Lyrae-type stars. During the late 1800s/early 1900s, Edward Pickering, director of Harvard College Observatory, hired many women to function as "computers" to reduce astronomical data. 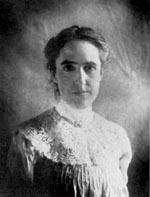 Pictured here is one of Pickering's many cheap hires, Henrietta Swan Leavitt. In addition to recognizing the Period-Luminosity relation, Leavitt is credited with discovering about 2400 variables during the course of her work. In 1912, Henrietta Swan Leavitt of Harvard College Observatory catalogued over 1777 variable stars in the nearby Magellanic Clouds. Of this impressive count, 25 were found to be of Cepheid-type and were located in the Small Magellanic Cloud (SMC). (At that time, the SMC was thought to be a nebula within the Milky Way Galaxy.) When Leavitt arranged the Cepheids by period, a surprising fact arose: ordering these stars in terms of increasing period revealed that they had also been ordered by increasing brightness. Thus, the resulting sort showed the brighter the Cepheid, the longer it took to vary. Upon finding this impressive relation, Leavitt reported that "A straight line can be readily drawn among each of the two series of points corresponding to to maxima and minima, thus showing that there is a simple relation between the brightness of the variable and their periods." This extraordinary finding proved to be a means of determining cosmic distances; a parameter which is crucial in our understanding of the Universe. Because of the work of this incredible woman, the foundation of modern astronomy had been set, and the field was about to go through a wonderful revolution. In 1917, American astronomer Harlow Shapley extended Leavitt's work to include Cepheids located in systems other than the SMC. He found that not only did the Period-Luminosity relationship hold for the SMC, but it could also apply to all Cepheids (although the relation is different for two types of Cepheids, as described below). Identify the star as a Cepheid variable by studying its spectrum (if possible) and/or by the shape of its lightcurve. Use the Period-Luminosity relationship to determine the absolute magnitude. Use the inverse-square law to calculate how far a star of that absolute magnitude would have to be moved from the standard distance of 32.6 light-years to appear as a star of the apparent magnitude observed. While examining the photographic plates of the Andromeda Nebula in search of novae, Edwin Hubble marked each suspect with the letter "N". On this plate, three suspected novae are indicated. Hubble later discovered that one of marked stars was actually a Cepheid variable. The "N" was subsequently crossed out and the star was relabeled as "VAR!" In 1923, American astronomer Edwin Hubble applied the Period-Luminosity relation to 12 Cepheid variables that he had discovered in, what had then been called, the Andromeda Nebula. The outcome proved to show that Andromeda was so distant that it could not be contained within our own Milky Way Galaxy, but must be a galaxy itself! This ground-breaking discovery drastically expanded the view of our Universe and the components it contains. An anology that astronomers use to help visualize this concept is that of a baking raisin bread. Imagine bread dough in which randomly distributed raisins have been placed - kind of like space with galaxies interspersed. As the dough bakes in the oven it expands, and the raisins, stuck in the dough, expand and move away from the other raisins - kind of like galaxies expanding with the fabric of space. From the viewpoint of one raisin (or galaxy) the remaining raisins (or galaxies) are moving with a motion that is receding from the reference point and likewise, when viewed from another raisin (or galaxy). By far, Hubble's most valuable contribution to modern science came when he published his paper on the velocity-distance relation in 1929. As a result of this finding, Hubble devised a linear relationship linking cosmic velocities and distances. This relationship, known as Hubble's Law, is expressed as: Vr = Hod, where Vr is the recessional velocity (how quickly a galaxy is moving away from us), Ho is Hubble's Constant, and d is the distance to the galaxy. In words, this relation implies that the deeper one looks into the Universe, the more the recession velocity increases. Or more simply stated: the Universe is expanding! Hubble has since had a remarable "landmark" named in honor of the terrific impact he has had on the scientific community: the Hubble Space Telescope (HST). With this impressive instrument, astronomers have probed deep into the Universe, and have discovered more treasures than ever imagined. Carrying on in the spirit of the Hubble, the HST is, among other things, continuing the astronomer's work with Cepheid variables. While ground-based observations have detected Cepheids in galaxies within 12 million light-years, studying Cepheids out to at least 30 million light-years away will provide scientists with the imformation needed to really study the overall expansion of the Universe. In 1994, observations of Cepheids in M100 (located at 56 million light-years) by the space-bound HST brought the distant standard candles closer in reach. The variability of Polaris occurs with a 3.97 day period and fluctuates by only a tenth of a magnitude, but the change is markedly detectable particularly through photometry. However, it has been seen that Polaris' variability is definitely on the decrease with just hundredth of magnitudes now being detected. Is Polaris ceasing to be a Cepheid? Currently, over 1000 stars of Cepheid-type have been catalogued, while the count continues to grow. These remarkable stars comprise one of the most interesting and important classes of variables known. Other bright, well-known Cepheids include eta Aquilae, zeta Geminorum, and surprisingly, the North Star Polaris! The later thus gives little credibility to Shakepeare's Julius Caesar when he spouted the words "I am as constant as the Northern Star." As a class, Cepheid variable stars are characterized by a change in brightness of several hundredths to 2 magnitudes, which occurs with extreme regular periodicity of just 1 to 135 days. Such stars are commonly of spectral class F at maximum and G to K at minimum, whereby the rule of thumb that applies is the later the spectral class, the longer its period. In terms of stellar evolution, this class of variable is seen to be pulsating luminous white or yellow giants, and may form a link between the red giant and main sequence-type phase. Stars that begin with 5 to 20 solar masses ultimately pass through the instability strip. Those that become Cepheids generally posses a specific range of temperatures (5000 to 6000 Kelvin). Cecilia Payne-Gaposchkin's 1925 doctoral dissertation titled "Stellar Atmospheres" has been called "the most brilliant Ph.D. thesis ever written in astronomy." Dr. Payne-Gaposchkin's life and work will be celebrated on what would be her 100th birthday in conjunction with the 89th Annual Meeting of the AAVSO. Join us in paying tribute to this remarkable lady. According to Payne-Gaposchkin (1979), "Probably all stars with masses more than three times that of our Sun - at least all that are not close binaries - will go through this stage and will therefore become Cepheids." Turner (1998) further explains that Cepheids are post-main-sequence objects that begin their lives as hydrogen-burning, B-type stars. At this stage, they have evolved such that hydrogen burning ceases to take place in the core of the star, and so they are going through more advanced stages of nuclear fuel consumption. In addition, Turner states that "They become unstable to radial pulsation perhaps five times during such stages: once during shell hydrogen burning, twice more during core helium burning, and twice again during shell helium burning." "Cepheids are law-abiding citizens, but they remain individuals, always reserving the right to deviate from their own laws to some extent." The majority of known extragalactic variables are believed to be of Cepheid type. Those classified as delta Cep variables yield to about 60% in the LMC, 78% in the SMC, 45% in the Andromeda Nebula (M31), and 54% in the Triangulum Nebula (M33) (Lipunova 1992). "In the Magenllanic Clouds, for instance, there are a large number of Cepheids with short periods. This is due to the low abundance of elements heavier than helium in theses galaxies. The evolution tracks differ from those in a galaxy such as our own with a more "normal" chemical composition, carrying more stars into the lower part of the instability strip where the periods are shorter" (Percy 1992). DCEP - classical Cepheids, delta Cephei-type variables. Comparatively young objects which have [left] the main sequence and are situated in the instability strip of the Hertzsprung-Russell diagram. They obey the well-known Cepheid Period-Luminosity relation, and belong to the flat component of the Galaxy. DCEP stars are present in open clusters. They display a certain relation between the shape of the light curve and the period value. CW - variables of W Virginis type. Pulsating variables of galactic spherical component or old disk population with periods approximately from 0.8d to 35d and amplitudes from 0.3m to 1.2m V. Obey a Period-Luminosity relation different from that for delta Cep variables. For an equal period value the W Vir variables are fainter than delta Cep variables by 0.7m-2m. The light curves of W Vir variables for some intervals of periods differ from the light curves of delta Cep variables for corresponding periods either by amplidtues or by the presence of humps on the descending branch, sometimes turning into broad flat maxima. W Vir variables are present in old globular clusters and under high galactic latitudes. Dr. Doug Welch of McMaster University in Ontario, Canada maintains an extensive database which houses numerous tables of published photometric and radial velocity data for galactic and extragalactic Cepheids. For more information about your favorite Cepheid, be sure to visit this site. Light curves of Cepheid variables are detectable by their shark fin-like shape. The patterns generally display a rapid rise to maximum, with a short stay at its brightest state, which is then followed by a smooth, slow decline to minimum. These "cosmic yardsticks," as Cepheids are referred to, are known for their precise and consistent periodicity; many stars have periods that are known to the second. Below is an example of the typical Cepheid shape as displayed by our featured star, delta Cephei. A portion of the delta Cephei light curve from the AAVSO International Database, which displays the typical shark-fin structure. The 20-day section shown is composed of nearly 750 observations, from 35 loyal AAVSO observers such as yourself. Knighted in 1930, Sir Arthur Eddington is best known for his work with the interior structure of stars. His observations of star positions during the 1919 total solar eclipse, however, provided confirmation of Einstein's general theory of relativity. With such regular and precise periods of variability, one would perhaps expect the observed variations to be the result of an eclipsing double star. However, it has been determined that these stars are pulsating, whereby they expand and contract in an alternating pattern. One of the earliest supporters of Cepheid pulsations was the English physicist, Sir Arthur Eddington. Eddington's theory proposed that the star's pulsation is the result of two opposing actions. While the force of gravity would cause the star to contract, the outward pressure of the gas would tend to expand the star. Briefly stated, it is postulated that as the star contracts under the force of gravity, the pressure increases. Since temperature is directly related to pressure, the temperature increases, which again increases the pressure, and so on. The inertia of the system causes the star to continue its tendency to contract, but the increasing pressure begins to build as an opposing force and eventually wins over so that an expansion begins. The cycle then reverses itself, whereby pressure and temperature are dropping as the star expands, but the force of gravity is fighting to pull the star inward. The forces battle against each other until gravity takes the upper hand and causes the star to again contract. The cycle then continues with the opposing forces as the star expands and contracts. Although Eddington is revered for his work with stellar interiors, this explanation does not fully coincide with the observed processes of the Cepheid variables. An interesting feature of this process is that maximum brightness occurs at a time which coincides with most rapid expansion. This observed process is contrary to what the theory predicts. Instead, the mechanism is revised such that Eddington's theory holds for the interior of the star. The outer layers, however, do not follow instantaneously with the same rhythm of the interior pulsations. "Cepheids are the most useful stars in the sky." Throughout its two centuries of fame, delta Cephei has been associated with breaking barriers of prejudice, and composing the building blocks of our understanding of the Universe. With all this majestic association and scientific fallout, how could one not be in awe of the Cepheid class of variables and its prototype, delta Cep? This humbly bright variable nearly becons its observers with promises of sure contentment. We hope that you too will fall subject to its mighty lure! Carlson, George A. "Sighting Cepheid Variables." Scientific American, November 1992, 128-130. Croswell, Ken. "The First Cepheid." Sky & Telescope, October 1997, 90-91. Fernie, J.D. "Classical Cepheids with Companions. I. Delta Cephei." The Astronomical Journal, 71, 1996, 119-122. Freedman, Wendy L. "The Expansion Rate and Size of the Universe." Scientific American, March 1998, online article. Gaskell, C. Martin. "Variable Star Observations in an Introductory Astronomy Course." Journal of the AAVSO, 20, 1991, 41-50. Hoskin, Michael. "Goodricke, Pigott and the Quest for Variable Stars." Journal for the History of Astronomy, 1979, 23-41. Lipunova, N.A. "The Extragalactic Variables in the Fourth Edition of the GCVS, in Variable Star Research: An International Perspective." In Percy, Mattei, and Sterken, eds., Variable Star Research: An International Perspective. New York: Cambridge UP, 1992, 55-59. ISBN 0-521-40469-X. Madore, Barry F. Cepheids: Theory and Observations. (Proceedings of the IAU colloqium no. 82.) Cambridge: Cambridge UP, 1985. ISBN 0-521-30091-6. Osterbrock, Donald. E., Joel A. Gwinn, and Ronald S. Brashear. "Edwin Hubble and the Expanding Universe." Scientific American, July 1993, 84-89. Payne-Gaposchkin, Cecilia. "Sighing Like Furnace-The Cepheid Variable." in Stars and Clusters. Cambridge, MA: Harvard UP, 1979. ISBN 0-674-83440-2. Percy, John R. "Variable Stars." The Physics Teacher, 31, December 1993, 541-543. Percy, John R., "Variable Stars and Stellar Evolution." In Percy, Mattei, and Sterken, eds., Variable Star Research: An International Perspective. New York: Cambridge UP, 1992, 137-147. ISBN 0-521-40469-X. Turner, David G. "Monitoring the Evolution of Cepheid Variables." Journal of the AAVSO, 26, 1998, 101-111. Welch, Doug has a web site which contains Cepheid Photometry and Radial Velocity Data Archive.